I may have mentioned this once or twice before, but, I’m always on the search for quick and easy meals that flavorful, don’t require a slew of ingredients and gives me enough leftovers for a few days. This pasta dish checks all of those boxes. I started by cooking the pasta. Then, I sautéed garlic, browned the sausage, added frozen peas and finally heavy cream and butter. After bringing it to a boil I added in the pasta and that was it. You can’t top something as simple as that. Bring a large pot of salted water to boil, add pasta and cooking for 8 to 10 minutes, until al dente and then drain. In a large skillet heat oil over medium heat and sauté garlic. Add the sausage and brown. Then add the green peas and simmer for 5 minutes. Slowly add the heave cream and butter and bring to a slight boil. Cook for 5 minutes and then toss with cooked pasta and top with parmesan cheese. Don’t worry… You’re not putting pasta in a pie crust with this pie. 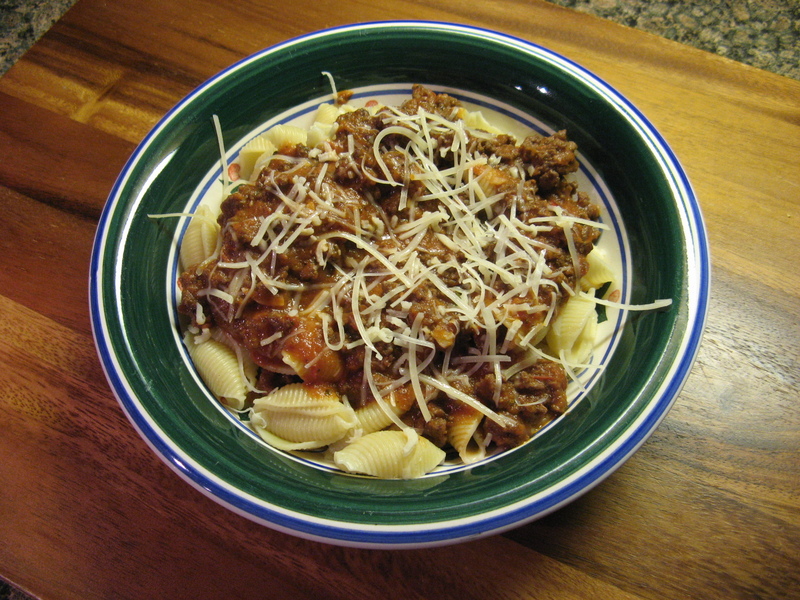 This is a fun variation on your basic pasta, sauce and cheese dish. You start off by boiling a pound of rigatoni pasta until it is lightly less than al dente – the minutes truly depend on the brand of pasta you buy. Once the pasta is ready, drain it and spread it on a baking sheet and toss with a tablespoon of olive oil. Next, line a baking sheet with aluminum foil and place a 9-inch springform pan in the center. Grease the pan with a tablespoon of olive oil and began standing the rigatoni on their ends in the pan until the entire pan is filled. Pour your favorite pasta sauce over the noodles and then sprinkle mozzarella and parmesan cheese over the sauce. Tent the pan with aluminum foil and bake for 30 minutes in a preheated 375 F oven. 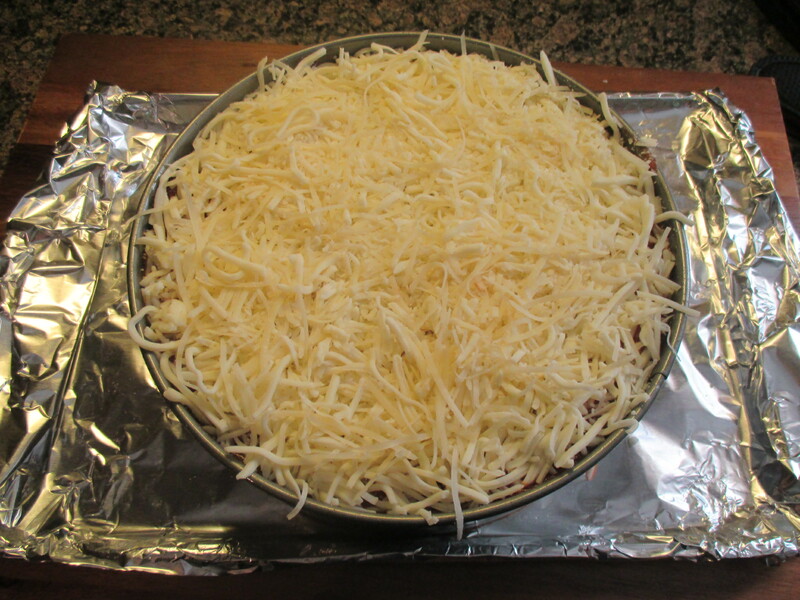 Uncover the pan and bake for about another 30 minutes, until the cheese is golden brown and bubbly. 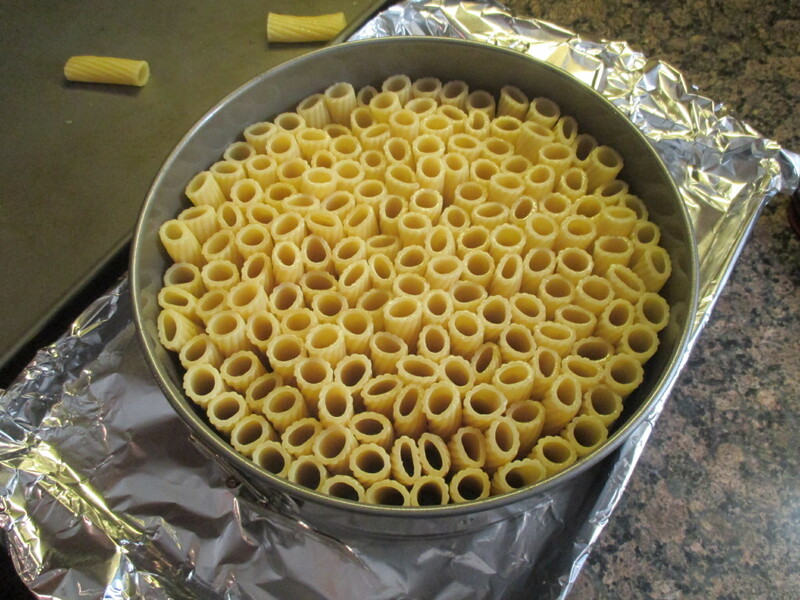 Let the pasta cool for 10 minutes and then carefully remove the ring from the pan, cut the pie and serve. Preheat oven to 375 F. Grease a 9-inch springform pan with a tablespoon of olive oil and place on a foil-lined baking sheet. Bring a large pot of salted water to a boil and cook the pasta until is slightly less than al dente. 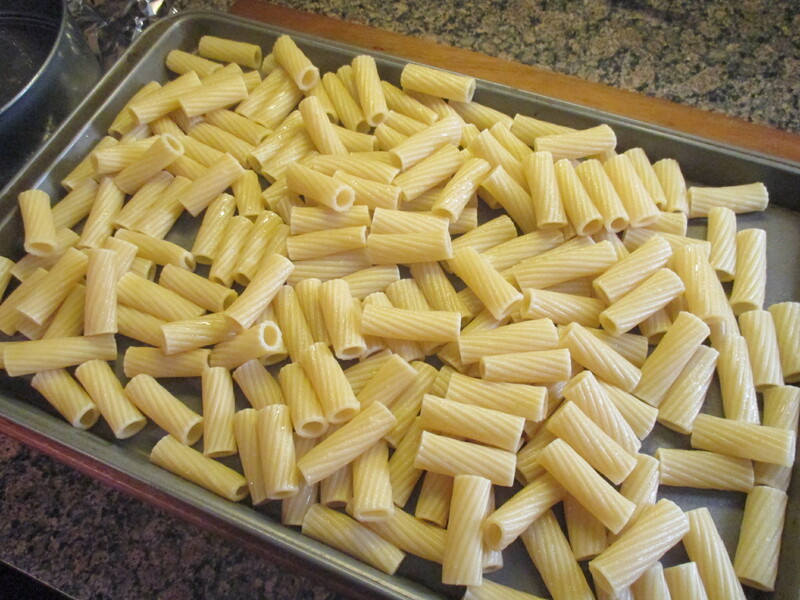 Drain the pasta, spread in a single layer on a rimmed baking sheet and toss with a tablespoon of olive oil. Stand the rigatoni on their ends in the prepared springform pan. Pour the sauce over the noodles and spread with the back of a spoon. Sprinkle with cheeses. 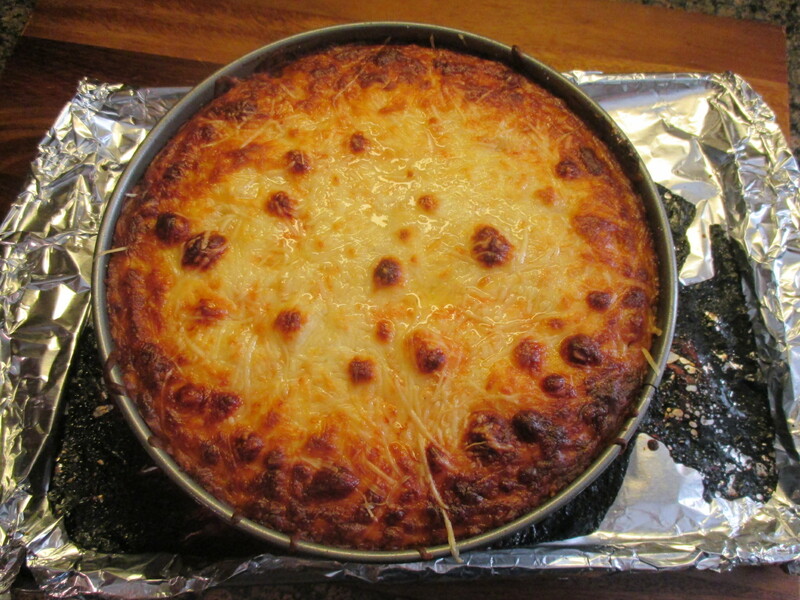 Tent the pan with aluminum foil and bake in the oven for 30 minutes, uncover and bake until the cheese us bubbly and golden brown, about an additional 30 minutes. Cool for 10 minutes and then remove the ring from the pan. 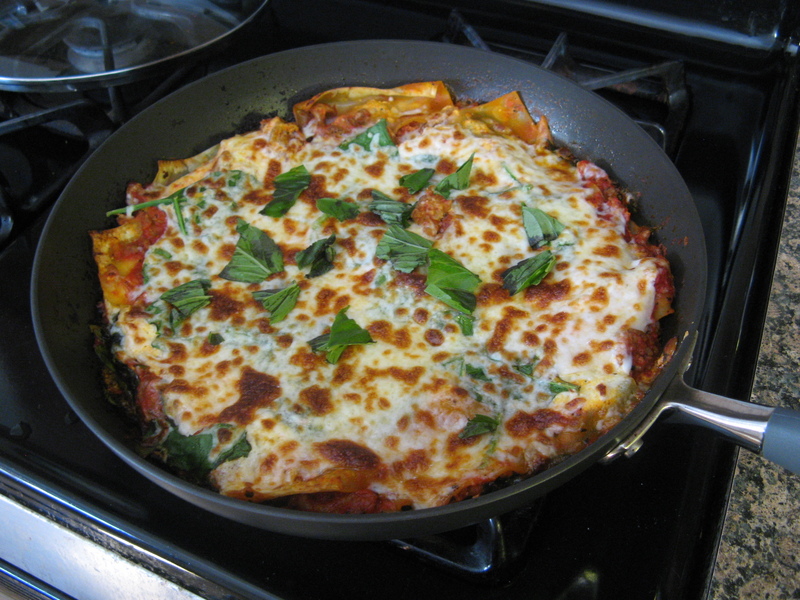 So, I wasn’t too impressed with this Skillet Spinach Lasagna right after I made it, but, after taking it to work the following day for lunch my opinion changed. I think what initially had me a little eh about it was the lack of sauce and the fact that the bottom of it got burned, but, both of those things are things that can easily be changed next time I make it. 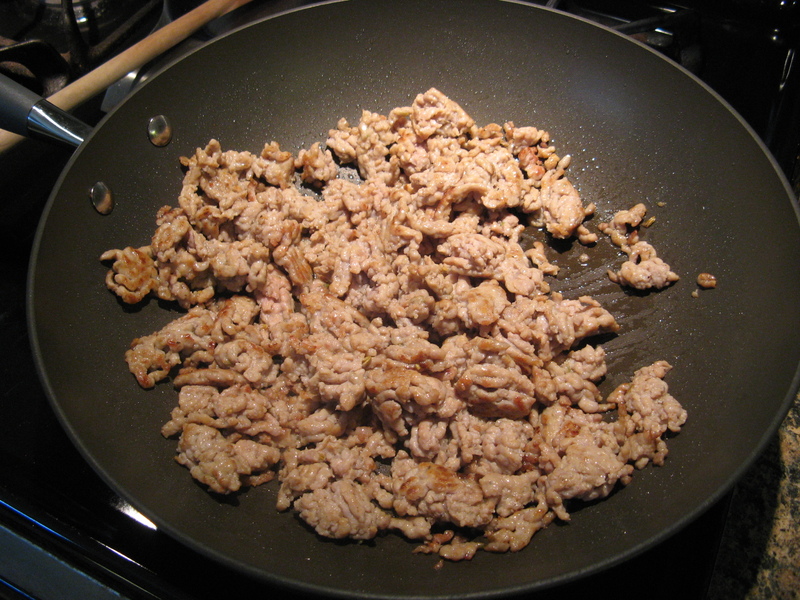 I began by browning a pound of sausage meat in a 12-inch skillet. I was able to find ground sausage meat, but, you could easily use a pound of sausage removed from the casings. Next, over medium heat, I added crushed tomatoes, Italian seasoning and salt. I let the sauce simmer for about 5 minutes. 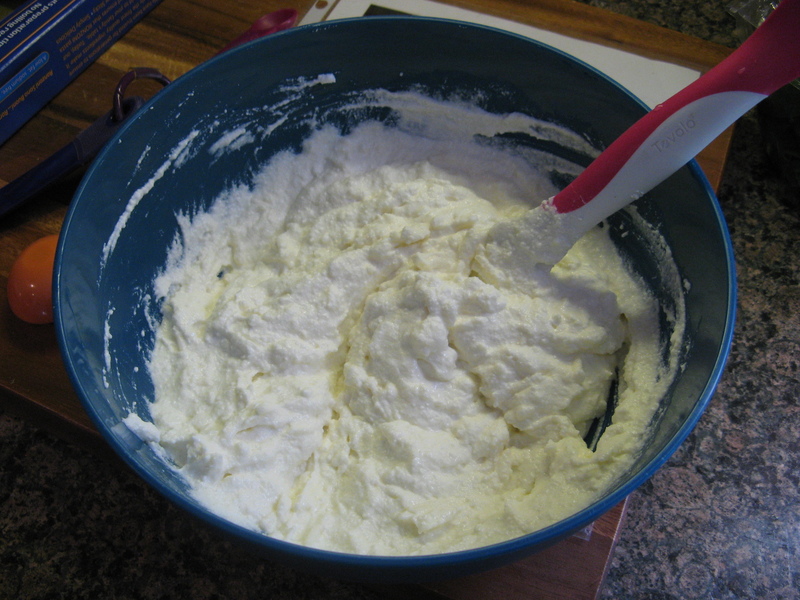 While the sauce was cooking, I combined ricotta cheese, an egg, a cup of shredded mozzarella and salt in a medium bowl. Once the sauce was ready it was time to assemble the lasagna. I set aside 3 cups of the sauce and placed a layer of no-boil lasagna noodles over the remaining sauce in the skillet. I then topped the noodles with a cup of the reserved sauce, 3/4 cup of the ricotta mixture and 3 cups of the spinach. I repeated the layer two times with the remaining ingredients, omitting the spinach from the top layer. I then returned the skillet to heat; covered and cooked over medium heat until the noodles were softened and sauce began to bubble, about 15-20 minutes. I think next time I will do this step over medium-low heat. I then topped it with remaining cup of spinach and covered and cooked it for another minute or so until the spinach had wilted. 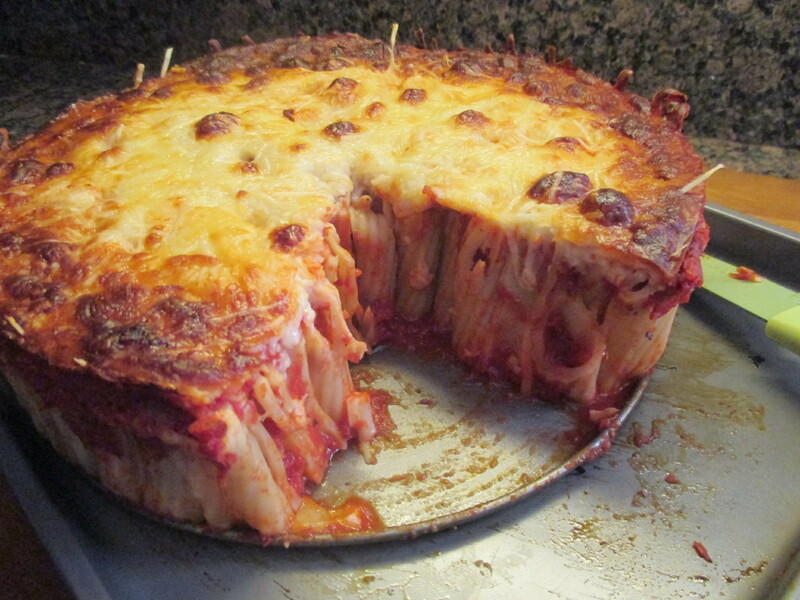 And finally, I uncovered the lasagna and topped it with a cup of shredded mozzarella and broiled it until the cheese began to melt and brown. About 5 minutes. I then sprinkled it with freshly chopped basil. Cook the sausage, stirring often, in a 12-inch ovenproof nonstick skillet over medium heat until browned and cooked through. Add the tomatoes, Italian seasoning and 1/2 teaspoon of the salt; cook, stirring occasionally until the sauce begins to simmer. While the sauce is cooking, combine the ricotta cheese, 1 cup of the mozzarella cheese, an egg and the remaining salt in a medium bowl. Preheat broiler with oven rack 6 inches from the heat. 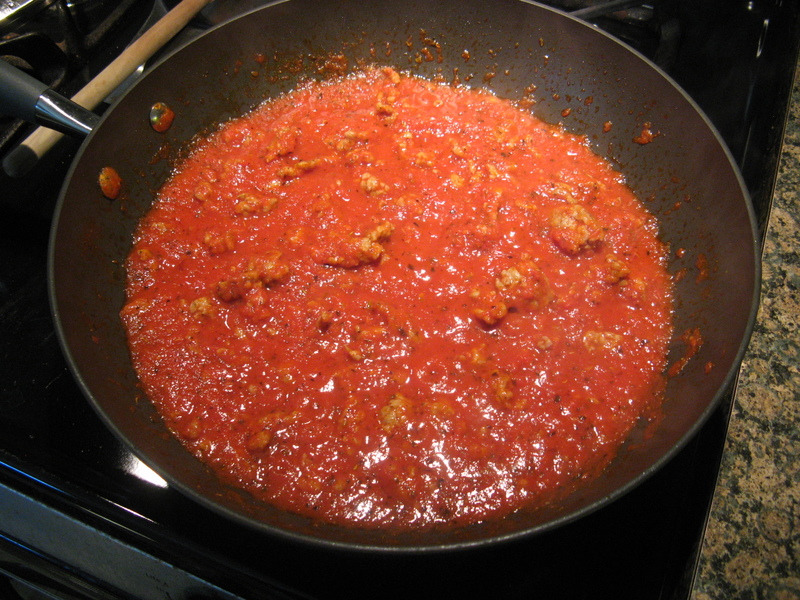 Once the sauce is cooked remove it from the heat, reserving 3 cups of the sauce in a bowl. Place a layer of the lasagna noodle over the sauce, breaking the pieces as necessary. Top with 1 cup of the reserved sauce. 3/4 cup of the ricotta mixture and 3 cups of the spinach. Repeat the layer two times with the remaining noodles, sauce, ricotta mixture and spinach, omitting the spinach from the top layer. Return the skillet to the heat; cover and cook over medium / medium-low heat until the noodles are softened and the sauce begins to bubble, about 20 minutes. Uncover and top with the remaining spinach; cover and cook for about a minute until the spinach is wilted. Uncover and top with the remaining mozzarella. Broil until the cheese begins to brown, 4 to 5 minutes. Sprinkle with basil.